According to the late Swiss psychiatrist, Carl Gustav Jung, dreams are a gateway to the collective unconscious. 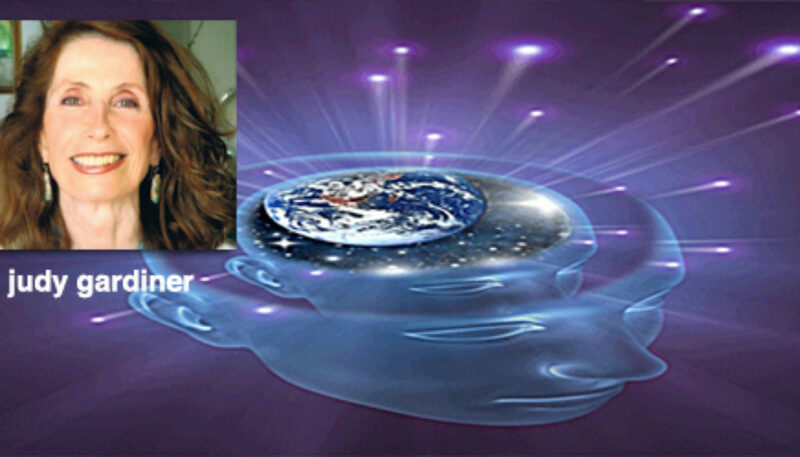 Dream decoder, researcher and explorer Judy Gardiner knows all too well how dreams can tell a multidimensional story about our personal and collective reality. From our distant past to visions of the future – dreams are a vault of information that we have stored within us – our own akashic record and we all have access to it – we just need to figure out how to learn its language. I spoke with Judy about her quest into understanding the complexity, beauty and importance of dreams. How her own dreams led her on a journey to understand that science and spirituality are inextricably linked and that our dreams are both personal and planetary and hold great meaning for the future of our species and of the world. Judy Gardiner has been a vivid dreamer all her life and this brought her, in 1992, to the serious study of dream interpretation. By connecting the symbols in her dreams, she discovered that they ultimately led to accurate explanations of geology, astronomy, chemistry, archeology, meteorology, medicine and other areas of study in which she was not schooled. She confirmed these explanations through extensive research into historical and scientific writings and developed a symbol system which incorporates scientific and spiritual dream imagery. What began as a self-study transformed to a cosmic wake-up call illuminating the union of Science and Spirit revealing an integrated theory of consciousness. The discovery of ancient knowledge and universal wisdom led her to write essays based on autobiographical dream material. Lavender ~ An Entwined Adventure in Science and Spirit, her first book, is part one of a sequel. After twenty years in corporate careers, she turned to her dreams and has devoted herself to building a methodology to connect their dots. From this effort was born the story of LAVENDER, named for one clue nestled among hundreds. As an ordinary person who dreams, she had often wondered what these strange patches of thought would mean if seamed into a whole quilt. Over the years, she consulted dream glossaries in the marketplace and was frustrated by the absence of a work that addresses the long-term significance of dreams, not in clinician’s terms or in recipe book definitions, but in the language of the average person. LAVENDER is a unique study of the Dream as an unfolding process that reveals the distinguishing features of one’s destiny. The book’s purpose is to dispatch a lifesaving message to humankind while illustrating diverse functions of the Dream: how it develops human potential, how it encourages spiritual and cosmic connection and how the struggle to survive begins with self and evolves to the species. Judy’s dreams debunk the eerie mystique of the afterlife feared by many as warped and strange. Some people are haunted by ghosts and still more live in fear of the unknown. In the mystical land of LAVENDER, doors open to a welcoming Unknown where enlightenment and protection, knowledge and compassion embrace us like old friends. In 2003, Judy Gardiner began collaborating with Dr. Montague Ullman, a leading figure in the field of dream work and founder of the sleep and dream laboratory at Maimonides Medical Center in Brooklyn, New York. Their work focused on the bidirectional nature of dreaming which points to both our internal and external environments. A member of the International Association for the Study of Dreams (IASD), in 2007 she launched her new approach to dreaming at Sonoma State University and published her paper at an online IASD conference. She then lectured at a Moving Toward Wholeness conference focusing on the dialogue between the psychology of Carl Jung and Christian spirituality. She consequently presented her work at the Jung Society, the Manitou Project, the Rhine Research Center, the Lifwynn Foundation and numerous other times at the IASD. Her workshops encourage participants to share dreams concerning the environment and the crisis we now face as a human species. Her interests in varied aspects of dreaming include: bi-directional dreaming, integration of science and spirit in dreams, electronic anomalies and other psi events connected to dreams, the relationship of dreams to quantum physics, panpsychism in dreams, anecdotal evidence of after-life survival of consciousness, the collective unconscious, and morphic field theory as demonstrated in dream materializations. Judy attended the University of Miami for two years, studied Film Production at New York University, and worked for over 20 years in advertising, publishing, and broadcasting holding positions with Batten, Barton, Durstine & Osborne, Holt, Rinehart & Winston Publishers and CBS Inc.
She now resides in New York City where she continues to write and research. The universal function of the Cosmic Dream is the driving force behind her work. By inspiring others to tap into the all-embracing knowledge within us, she strives for a deeper understanding of species-connectedness in a disconnected world. Her fondest wish is that Cosmic Dreaming will someday become a cathedral of dreams.